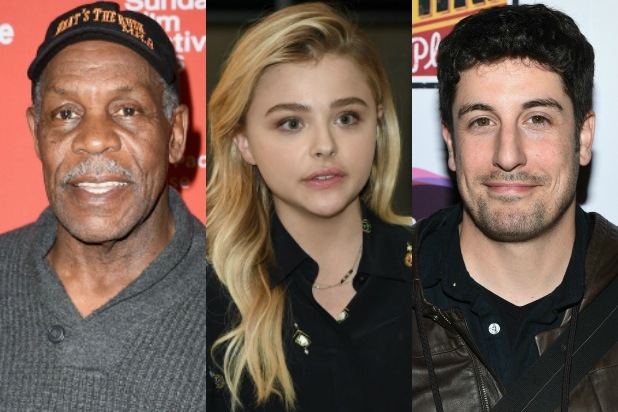 The 15th annual Tribeca Film Festival (TFF) unveiled its jury pool today, which includes Danny Glover,Liev Schreiber and Chloe Grace Moretz, to name just a few. Jason Biggs, Sam Taylor-Johnson, Mike Birbiglia, Alan Yang, Rachael Leigh Cook, Judy Greer, Mark Conseulos and Mary Stuart Masterson are among some of the other bigger names involved. The jury will be divided among 11 competitive TFF categories. The winners will be announced at the TFF Awards Night ceremony on Thursday, Apr. 21, when the eight juries will award $155,000 in cash and prizes. The 2016 festival itself runs from Apr. 13-24. Below is a list of all 2016 festival jurors and their respective categories. All descriptions are in Tribeca’s own words. Anne Carey: Anne Carey is an Independent Spirit Award-winning producer and President of Production at Archer Gray. As independent producer, Carey has collaborated with seminal filmmakers such as Ang Lee, Mike Mills, Liz Garbus and Mari Heller. Recent credits include Mr. Holmes and The Diary of a Teenage Girl and the upcoming 20th Century Women. James Le Gros: Independent Spirit Award-nominated and SAG Award-nominated actor whose credits include Drugstore Cowboy, Living in Oblivion, Safe, Lovely & Amazing, Zodiac, “Ally McBeal,” “Mildred Pierce,” “Girls” and the upcoming Certain Women. Chris Nashawaty: Chris Nashawaty has been a writer at Entertainment Weekly since 1993, and the magazine’s film critic since 2013. He is the author of Crab Monsters, Teenage Cavemen, and Candy Stripe Nurses: Roger Corman, King of the B-Movie. Mya Taylor: Mya Taylor is an actress and singer best known for her acclaimed role as Alexandra in Sean Baker’s award-winning 2015 film Tangerine. For her performance, she was the recipient of an Independent Spirit Award for Best Supporting Actress, designating her the first transgender actor to win at the awards show. Jennifer Westfeldt: Jennifer Westfeldt is a Tony-nominated actress and filmmaker, best known for writing and starring in the indie hits Kissing Jessica Stein and Friends With Kids (which marked her directorial debut). Hany Abu-Assad: Hany Abu-Assad was born in Nazareth, studied in Holland, and makes movies globally. His movies Paradise Now and Omar were both nominated for Oscars. Jean Reno: Jean Reno is a renowned French actor who gained international recognition with pivotal roles in films such as Mission Impossible opposite Tom Cruise, Ronin opposite Robert De Niro, and The DaVinci Code opposite Tom Hanks. Reno will next appear on the big screen in The Promise, a film directed by Terry George, and The Last Face, directed by Sean Penn. Lydia Dean Pilcher: Lydia Dean Pilcher is founder of Cine Mosaic, and producer of over 35 features including a long term partnership with director Mira Nair. Recent films include the upcoming Queen of Katwe for Disney, The Lunchbox, and Academy Award nominated Cutie & the Boxer. Sam Taylor-Johnson: Sam Taylor-Johnson is an internationally renown artist working mostly in the photographic medium. She is also a critically acclaimed film director who has recently become the highest grossing box-office female director of all time. Film credits include Nowhere Boy, Fifty Shades of Grey and Love You More. Danny Glover: Actor, producer and humanitarian, Danny Glover has been a commanding presence on screen and on stage for more than 30 years. His film credits range from the blockbuster Lethal Weapon franchise to smaller independent features. Glover co‐founded NY based Louverture Films, has served as a Goodwill Ambassador for the United Nations Development Program and is currently serving as UNICEF Ambassador. Laura Poitras: Laura Poitras is a filmmaker best known for her post-9/11 trilogy and Citizenfour. Her exhibition Astro Noise is at the Whitney museum until May 1, 2016. She is co-creator of Field of Vision (https://theintercept.com/fieldofvision/), and is editing a film about Julian Assange. Douglas Tirola: Douglas Tirola is an award-winning director and producer whose work includes Drunk Stoned Brilliant Dead, Kate Plays Christine, Hey Bartender and Making the Boys. He is President of New York based production company, 4th Row Films. Roger Ross Williams: Academy Award winner, Roger Ross Williams, is the director of the acclaimed films Music By Prudence, God Loves Uganda and the recent Sundance award winning Life, Animated. Hill Harper: Actor, author & humanitarian, Hill Harper…. Star of “Concussion”, “1982” & CBS’s ‘Limitless’. Col Needham: Col Needham is the founder and CEO of IMDb, the #1 movie website in the world. Ry Russo-Young: Ry has been making independent films for eleven years; her work has premiered and won awards at several international film festivals. She is currently in post-production on her fourth feature, Before I Fall based on the best-selling young adult novel of the same name. You Won’t Miss Me won a Gotham Independent Film award in 2009. Nobody Walks, co-written with Lena Dunham, won a special Jury Prize at Sundance. Ry has received accolades from the New York State Council on the Arts, the Tribeca Film Institute, the LEF Foundation, and the Sundance Institute. Karen Cooper: Since 1972 Karen Cooper has been Director of Film Forum, presiding over the growth of this NYC non-profit cinema. Cooper and Mike Maggiore co-program the theater’s NYC premieres. Sebastian Silva: Chilean writer, director Sebastian Silva has been one of the rare talents to win international acclaim very early in his career. His work has been recognized and awarded at the Golden Globes and Sundance on multiple occasions. He recently directed and acted in his film Nasty Baby which premiered at Sundance. Mike Birbiglia: Mike Birbiglia is a comedian, writer, actor and director. He is currently starring in his third critically acclaimed one-person show, Thank God for Jokes Mike’s forthcoming feature film, Don’t Think Twice, which he wrote, directed, and stars in, will be released in 2016. Chloe Grace Moretz: Chloe Grace Moretz made her debut at age seven and has starred in more than 35 films since then. From TV, films, theatre to lending her voice for animated films, Chloe has done it all. Her recent releases include The Fifth Wave, If I Stay and The Equalizer. She has been recognized for her performances by leading publications and has won various awards as well. Sheila Nevins: Sheila Nevins, the President of HBO Documentary films is one of the most awarded producers of all time. Her awards include 31 Primetime Emmys, 34 News and Documentary Emmys, 40 George Peabody Awards and a 2005 Emmy Lifetime Achievement Award. Maria Cuomo Cole: Maria Cuomo Cole is an award-winning producer of the feature documentary, Newtown, which premiered at the 2016 Sundance Film Festival. In her career, she has tackled such relevant subjects as gun violence, homelessness, veterans’ PTSD, Domestic Violence and sexual assault. Mark Conseulos: Actor and producer, Mark Conseulos will next be seen in the feature films Nine Lives, All We Had and the TV series”Queen of the South.” Recent credits include Kingdom and Alpha House. Alan Yang: Alan Yang is the co-creator of the Netflix series “Master of None.” Previously, he was a writer and producer for “Parks and Recreation,” for which he was nominated for an Emmy in 2015. Jessica Brillhart: Jessica Brillhart is the Principal Filmmaker for Virtual Reality at Google. Jigar Mehta: Jigar Mehta is passionate about entrepreneurship and intersection of media. As the lead of digital operations at Fusion, he strives towards creating impactful online experiences. Formerly as the lead of engagement at AJ+ Jigar helped the news brand reach 2.2 billion Facebook views. Saschka Unseld: Saschka Unseld is a German-born writer and director. After directing multiple award winning short films, including the 2013 Pixar short The Blue Umbrella, he co-founded Oculus Story Studio where he now works as a Creative Director, exploring the future of VR storytelling. He’s currently finishing up his upcoming VR experience, Dear Angelica. Rachael Leigh Cook: Rachael Leigh Cook is an American actress best known for her roles in She’s All That, Josie And The Pussycats, Into The West and Perception. She has also appeared in many critically acclaimed films alongside Hollywood’s biggest stars. Judy Greer: Judy Greer is a prolific actress of film and television that has appeared in over 80 roles to date including in The Descendants, Jurassic World, Ant Man, 13 Going on 30 and many more. Mary Stuart Masterson: Founder of Stockade Works, a net zero film and technology studio in Kingston, NY, Mary Stuart Masterson’s film, TV and theater career has received acclaim both as an actor and director. Her directorial debut, The Cake Eaters, premiered at Tribeca Film Festival in 2007. Laurie Anderson: Laurie Anderson is a multi-media artist and lives in New York. Scott Carlson: Scott Carlson is the man of many talents. Over the period of 20 years, he has worked at several agencies and co-founded Van’s General store. He is a renowned storyteller from the advertising industry who has mastered fine arts, films, digital media and pop-culture. Judy McGrath: Emmy award-winning MTV Networks veteran Judy McGrath has championed creating content for young adult consumers. In 2013 she founded Astronauts Wanted, a next gen digital studio and a joint venture between McGrath and Sony Music Entertainment. Liev Schreiber: Golden Globe and Primetime Emmy nominee Liev Screiber is one of the finest American actors who was recently seen in Oscar and Golden Globe award-winning film, Spotlight. He has also won Tony award for his Broadway performance. In 2005, he made his feature directorial debut with Everything is Illuminated. Hank Willis Thomas: Hank Willis Thomas is a New York based photo conceptual artist working primarily with themes related to identity, history and popular culture. He was recently appointed to the Public Design Commission for the city of New York. Jessica Alba: Jessica Alba is an actress, advocate and New York Times bestselling author. She is founder and chief creative officer of The Honest Company and Honest Beauty. Steve Aoki: Steve Aoki is a Grammy-nominated international producer/ DJ, electronic music entrepreneur, and founder of the trendsetting record label, events/ lifestyle company and apparel line Dim Mak. DJ Khaled: DJ Khaled is an American record producer, radio personality, DJ and record label executive. David Gordon Green: David Gordon Green is a director that made such films as George Washington, All the Real Girls, Pineapple Express, Your Highness, Prince Avalanche, Joe, Manglehorn, Our Brand is Crisis and the HBO series “Eastbound and Down.” Green is currently working on the Amazon series “Red Oaks,” the HBO series “Vice-Principals” and the film Stronger. Marc Mathieu: Marc Mathieu is chief marketing officer of Samsung Electronics America responsible for marketing the company’s portfolio of mobile, virtual reality, home entertainment and home appliances as well as signature services including, the Milk platform and Samsung Pay. Shay Mitchell: Shay Mitchell is most recognizable for her leading role on ABC Family’s hit show “Pretty Little Liars.” She will next be seen in Mother’s Dayopposite Jennifer Aniston. She recently released her first novel BLISS. 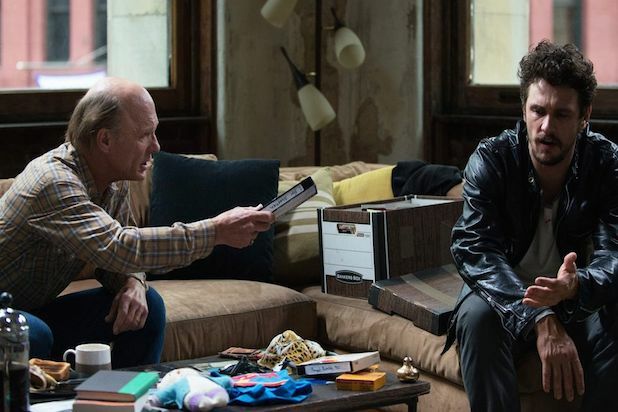 "The Adderall Diaries" sees a troubled writer played by James Franco throw himself into a hot murder case in an attempt to curb prescription drug addiction and get his mojo back. Richard Gere's "Franny" tells of a wealthy eccentric who meddles in the affairs of a recently deceased friend's daughter (Dakota Fanning) and her husband (Theo James). "Havana Motor Club" is a lively documentary about the underground automotive scene in Havana, which thrived long after Castro banned drag racing in the 50s. From executive producer Michael Strahan, "Play it Forward" is a documentary following hall-of-fame hopeful Tony Gonzalez as he finished his last year in the NFL. A legend in New York and documentary filmmaking, Albert Maysles' posthumous "In Transit" tugs appropriate heartstrings as it follows passengers on the nation's most highly trafficked train route "The Empire Builder." "Song of Lahore," another documentary, celebrates the brave musicians who struggled to maintain their artistry after the Islamization of Pakistan in the 1970s. "Tom Swift and His Electric Rifle" positions the seemingly benign Taser, manufactured in 1999 as a deadly weapon police apply with little to no regulation. Leah Wolchok brings unfettered access to the instution of The New Yorker's single panel cartoons with "Very Semi-Serious." In "A Courtship," Amy Kohn takes a sensitive lens to the conventions of a modern Christian courtship, wherein young women entrust their families to find a suitable husband in step with their faith. Jean Finlay gives a fascinating look at a mysterious singer who sounded note-for-note like Elvis Presley, was exploited by record companies and heard by adoring fans since the 1970s in "Orion: The Man Who Would Be King." Comic filmmaker and Internet child Patrick O’Brien documents his journey with ALS, aimed to fly in the face of the degenerative disease as well as offer a few laughs in "TransFatty Lives." "Anesthesia" packs a major star cast in this drama about the intersecting lives of lonely New Yorkers played by Kristen Stewart, Sam Waterston, Glenn Close, Corey Stoll, Gretchen Mol and Michael K. Williams. "Bleeding Heart" sees another leading lady effort from Jessica Biel, content in a yuppie clean living existence until she's burdened with taking in her troubled younger sister. The latter has a deeper effect on the former, as Biel's character's perfect world comes undone. In a strange but sweet scenario, "Maggie" sees Arnold Schwarzenegger as a father in denial about his daughter's (Abigail Breslin) affliction: she's rapidly become a zombie thanks to an outbreak in their farming town. Equal parts comical and violent, "Mojave" reteams Oscar Isaac and Garrett Hedlund ("Inside Llewyn Davis") on a road trip adventure with a dark bend. "A Nazi Legacy: What Our Fathers Did" finds two living sons of Nazis convicted in the Nuremberg trials, probing at memory, legacy and the remembrances of a historical horrors. "Prescription Thugs" sees documentarian Chris Bell dress down the giants of the American pharmaceutical companies as he previously did steroids in "Bigger Stronger Faster." A four year lesson from Noam Chomsky on what has created profound American economic disparity is packaged in "Interests," from directors Peter Hutchison, Kelly Nyks, and Jared P. Scott. Executive producer Martin Scorsese and director Nick Sandow ("Orange Is The New Black") weave a fascinating tale of a man obsessed with mob movies (Vincent Piazza) and his wife (recent Oscar winner Patricia Arquette) as they chase drugs and money in efforts to recreate the lifestyle. Amber Heard and Christopher Walken make an odd and wonderful father-daughter team in "When I Live My Life Over Again," where Heard's flighty city girl heads to the Hamptons home of her dad, a former singer. Famed Italian filmmaking brothers Paolo and Vittorio Taviani offer up "Wondrous Boccaccio," a gorgeous tale about a group that escapes the plague in Florence for an artistic retreat in the country. "Rifftrax Live: The Room" reteams Mike Nelson, Kevin Murphy and Bill Corbett of "Mystery Science Theater 3000" to skewer cult classic films. In this case, they set their sights on Tommy Wiseau's "The Room." "Goodfellas" clearly isn't a premier title but rather a 25th anniversary screening, and what better place to roll out the Ray Liotta classic than Tribeca? Traditional production of Saké has changed very little over the centuries. Erik Shirai’s "The Birth of Saké" offers a rare glimpse into a family-run brewery that’s been operating for over 100 years.